If you had to choose one dive destination for the rest of your life, where would it be? In this week’s 123RF World Travel Guide, we kick-start our journey amid magnificent fjords and waterfalls in Norway’s Geirangerfjord. Next, rent a 4×4 and embark on your desert escapade in Oman’s Sharqiya Sands. Following that, we head to Micronesia’s Palau and dive into the world’s best waters for an unforgettable experience. 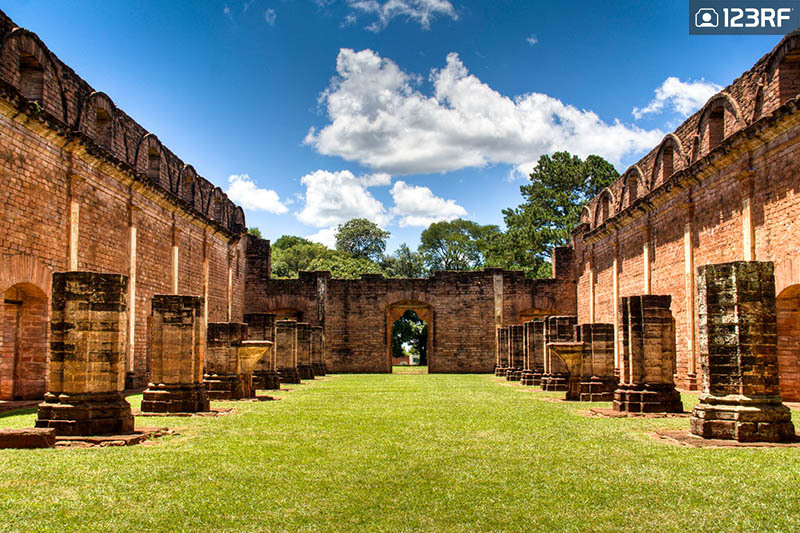 Finally, we travel to Paraguay, South America’s forgotten land, and discover its beautiful coasts and hikes. The gorgeous views of Lofoten islands. 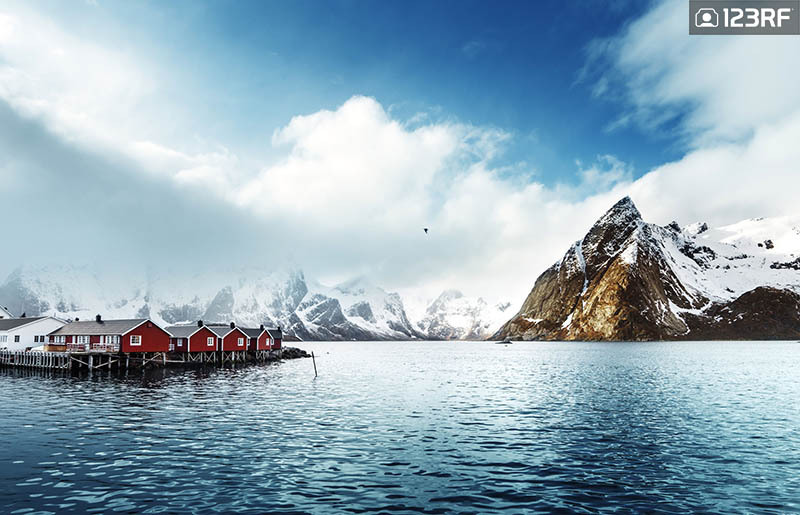 For the 123RF World Travel Guide, Norway is beautiful. Mountainous terrains accommodating powerful glaciers and magnificent fjords are a great treat to your eyes and lenses. And the best of Norway, lies in the majestic Lofoten Islands. The abundance of tiny, picturesque towns and galleries scattered are not to be missed. So simply rent a car, stock up on gas and enjoy the beautiful scenery. For nature lovers, continue your travels with a trip to Geirangerfjord. The explicitly stunning fjords and waterfalls here truly are a sight to behold. Meanwhile, if you’re keen on spending a night or two in a town, look no further than Bergen. This serene setting accommodates the colorful UNESCO-listed Bryggen wooden houses that are a must-see during your travels here. Oman offers one of the most authentic travel experience for the Arab world. From the forts and museums of Muscat, to Salalah’s Arabian sea beaches, there’s something in store for every traveler. The 123RF World Travel Guide recommends beginning your trip with a pit stop in the capital city. The Sultan Qaboos Grand Mosque and Al Alam Palace are both tremendous feats of architecture. Meanwhile, the Mutrah Souq market is a great way to get in touch with the local culture. Additionally, no trip here is complete without a visit to the Sharqiya Sands desert. Here, rent a 4×4 and cruise across large plains of beautiful orange-hued sands. 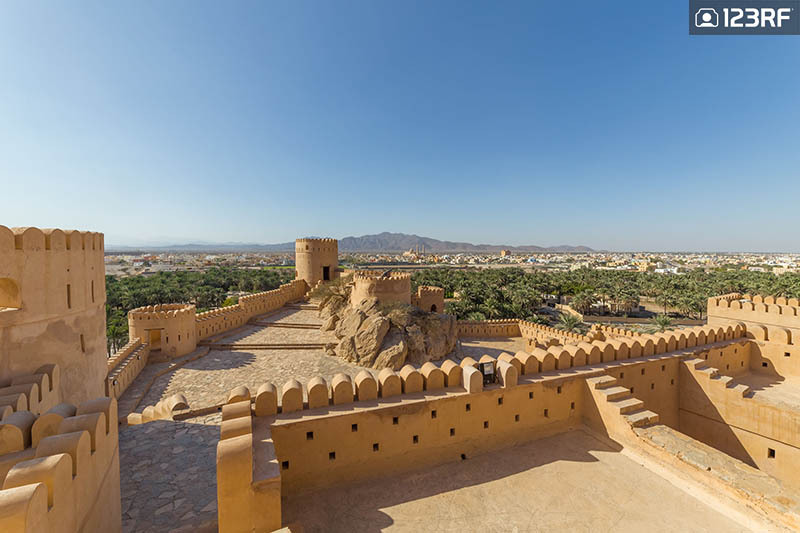 For the ultimate adventure, make your way to the majestic Nakhal Fort. This ancient castle offers you to witness the past war techniques like spiked doors and cannonball-deflecting round towers, coupled with breathtaking views of the Batinah plain. Iceland? Norway? or Scotland? No, it’s Pakistan. Pakistan is not for the faint hearted. Cities are crammed like sardines, kebabs burst with bold flavors, mountains soar higher than ever and buildings are adorned with some of the best works of art. Unfortunately, Pakistan has been overlooked because of its security concerns. However, it’s time to put aside your fears and banish the misconceptions around this remarkable land. The bustling city of Lahore remains to be the soul of the country. The city is a cultural melting pot so be sure to sample Lahore’s fantastic street delicacies. Also, be sure to check out the stunning Sheesh Mahal complex. Located in the historical Lahore Fort, this pavilion is adorned with the finest works of architecture that oozes with a magical affair. Next, head to the iconic Mohenjo-Daro to step into the times of the Indus Valley civilization. Finally, for the best experience, rent a ride and explore the road of the beautiful Karakoram highway. For the 123RF World Travel Guide, this is a for a road trip like never before. 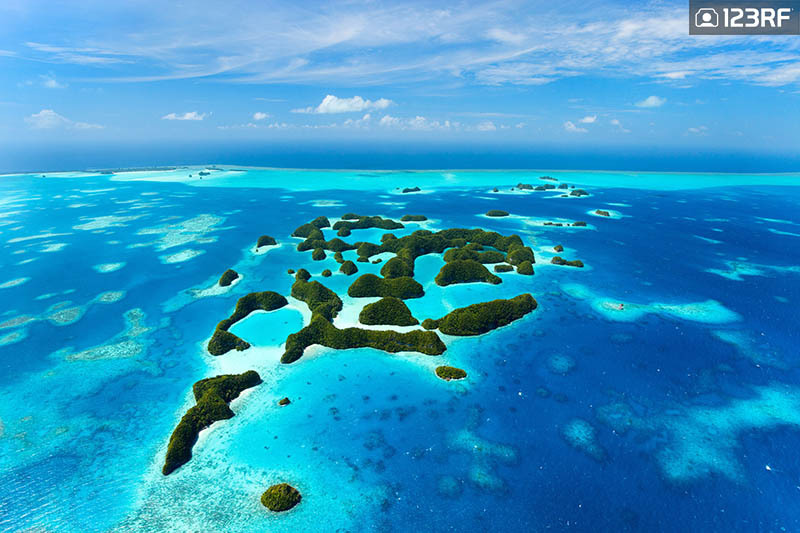 Ariel views of Palau’s beautiful islands. The 123RF World Travel Guide identifies Palau as a true natural wonder. What this island lacks in size, it surely makes up for in beauty. Part of the Micronesia region, this string of limestone and volcanic islands are perfect for the ideal getaway. Here, the famed Blue Corner and Chandelier Cave are the best of the lot. The former homes some of the richest marine life, while the latter offers the chance to explore fascinating stalactites formations, if you’re bold enough to brave the darkness and the risk of claustrophobia. In short, spending the day surrounded by the world’s best corals and turquoise lagoons is an opportunity not to be missed. If that does not float your boat, then opt to lay in hammocks, sipping pina coladas. 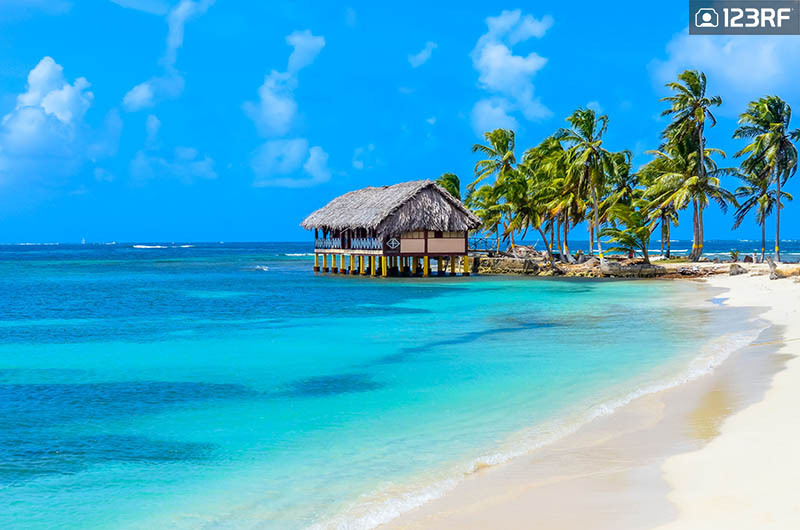 Turquoise waters of idyllic San Blas island. Panama is your private sanctuary for paradise. And the San Blas Islands are the best testament to this tagline. This archipelago is home to the Guna community and the area dishes out mesmerizing views of the ocean. Meanwhile, the 123RF World Travel Guide recommends Volcan Baru for nature enthusiasts. Scale the heights of Panama’s highest peak and enjoy fantastic views of the Caribbean. Next, don’t skip out on the historical Panama Viejo. This UNESCO Heritage Site shows the remains of the old Panama City. Additionally, spend the rest of the day in the capital. The intriguing BioMuseo and the beautiful San Jose church are perfect for you to waltz into. The former pays homage to the country’s rich biodiversity, while the latter homes one of the world’s most prized altars. 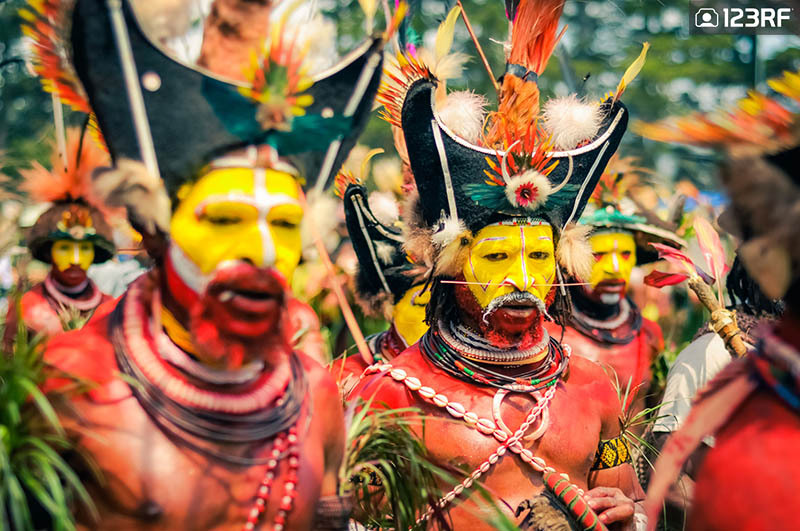 Mount Hagen cultural show celebrates Papua New Guinea’s proud tribes. Papua New Guinea is an adventure. The country’s diverse landscapes promises to entice travelers looking to step into the road less traveled. And hiking is one of the most popular activities here, with Mount Wilhem being the pick of the bunch. 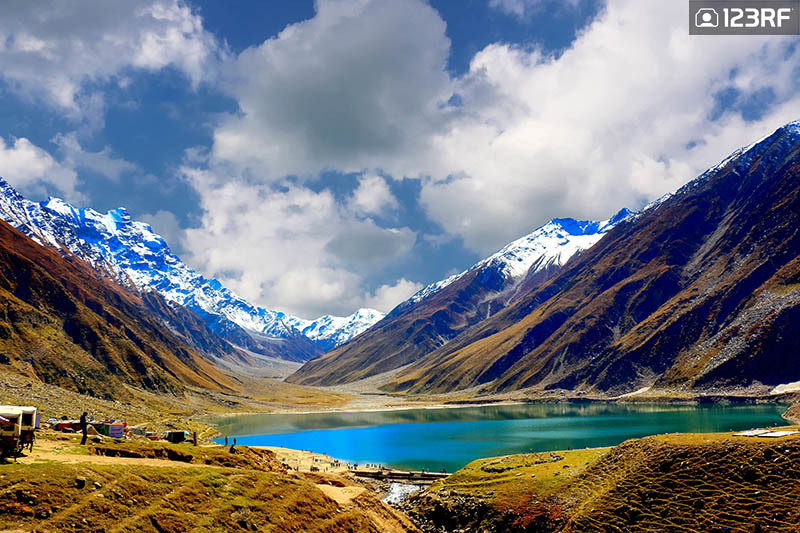 This trek provides a challenge to both, seasoned professionals and amateurs. Standing over 4500 meters, this soaring mountain also dishes out the country’s best views. Next, the 123RF World Travel Guide recommends making your way to the exciting Kimbe Bay. With over 400 species of corals, the island is rather fittingly dubbed the coral crucible. So a dive here enables you to catch a glimpse of what many believe are the world’s first corals. Finally, if the landscape does not satisfy your travels, then opt to spend time absorbing the rich cultures of the local highlanders. The Jesuit Mission ruins is a UNESCO World Heritage Site in Trinidad. Paraguay is in danger of being forgotten, in favor of other more glamorous South American nations. However this rough diamond certainly has what it takes to surprise the average traveler. The Saltos del Monday is perfect reflection of Paraguay; often forgotten for popular attractions. In this case, it’s the Iguazu Falls, as most travelers chose to witness this spectacle via Argentina or Brazil. However, the Monday falls offers locals an opportunity to step into the wild and experience nature’s raw power. Next, the 123RF World Travel Guide picks, Laguna Blanca for an idyllic escapade. This beautiful coast homes gorgeous white beaches that’s best explored barefoot. Paraguay’s charm also takes us to the heights of Cerro Pero. Come equipped with a pair of decent hiking boots and make your way to the top to reward yourself with mesmerizing sunrise views of the city. Next up on our 123RF World Travel Guide, join us as we scale the heights of Peru’s ethereal Mach Picu and go in search of Shangri-La in Moldova’s hidden gems. Also, catch up on our previous 123RF World Travel Guide series where we witnessed the glamor of Monaco and the surreal stars of Namibia’s Milky Way. Finally, keep up with the rest of our tales to document the world’s best travel destinations. Also, do check out how our resources help develop your own story for your blog, magazine and website.